Natural fragrance chemicals can be derived naturally from plants, fruits and spices or the can be synthetically obtained. These aromatic chemicals can be extracted from essential oils, oleoresins, distillates, fractions and others. Natural fragrance chemicals are used in extensive range of products in wide range of end-user industries on account of changing consumer behavior. Consumers demand for more eccentric fragrances in various end-use products has resulted in extensive research and development of new variety of natural fragrance chemicals. Natural fragrance chemicals are used in baby oils, household cleaners, oral care, room fresheners, detergents, mosquito repellents, soaps and many more products. The property of these chemicals being non-toxic to synthetic chemicals makes them more attractive to end-use industry manufacturers. On account of these fragrances obtained from natural resources, natural fragrance can be used for therapeutic purposes as well helping to relieve stress, body pain and skin problems. These chemicals are comprehensively used in the perfume industry for personal care. The natural fragrances obtained consist of various natural fragrances that could be fruit-based, flower-based, musk-based, wood-based, spice-based and various other aromas present in the nature. Natural fragrance chemicals are also being used in pharmaceutical and healthcare industry from a past few years. These extensive applications of natural fragrances are predicted to drive the market sturdily over the forecast period. Natural Fragrance Chemicals Market is anticipated to record a CAGR of 7.2% over the forecast period. The natural fragrance chemicals market is predicted to reach at USD 7.12 billion at the end of the forecast period. Many multi-national companies are concentrating towards new product advances in natural fragrance chemicals. Moreover, new uses for natural fragrance chemicals are discovered on regular basis in various new products such as humidifiers, aroma diffusers, cleansing foams and others which are expected to drive the natural fragrance chemicals market rapidly. Currently the global natural fragrance chemicals market is observing vibrant growth owing to increasing demand of aroma beauty as well as personal care products in the market. Advances in fragrance industry in the past few years and growing chemical explorations are projected to drive natural fragrance chemicals market besides the wide range of functions of natural fragrance chemicals in an immense range of products such as candles, baby powders, hair oils, shampoos, candies, syrups, detergents, and toiletries during the forecast period. On the basis of regional platform, global Natural Fragrance Chemicals market is segmented into five major regions including North America, Europe, Asia Pacific, Latin America and Middle East & Africa region. As a precursor to fragrance builder in perfumery industry, North America is panned to observe substantial natural fragrance chemicals market growth due to rising natural fragrance chemicals usage in cosmetics and personal care products. North America is estimated to be followed by Asia-Pacific in terms of consumption due to expanding natural fragrance chemicals requirements in home care and healthcare industries. Due to multiplying natural fragrance chemicals uses in growing aroma therapy industry to reduce pain, stress and depression, Asia Pacific is budding as a regional natural fragrance chemicals consumption market. The rising demand for natural fragrance chemicals and its products for various processes in pharmaceutical, cosmetic, food and beverage industries are expected to drive the market rapidly over the forecast period. The growing R&D activity associated to natural fragrance chemicals is further expected to increase the market growth on account of the discovery of new applications on regular basis. Rapid economic development with increasing disposable income of the current population is expected to boost the natural fragrance chemicals market. Moreover, growing urbanization and increasing adoption of premium products on account of changing lifestyles is anticipated to contribute significantly to the growth of natural fragrance chemicals over the forecast period across the globe. 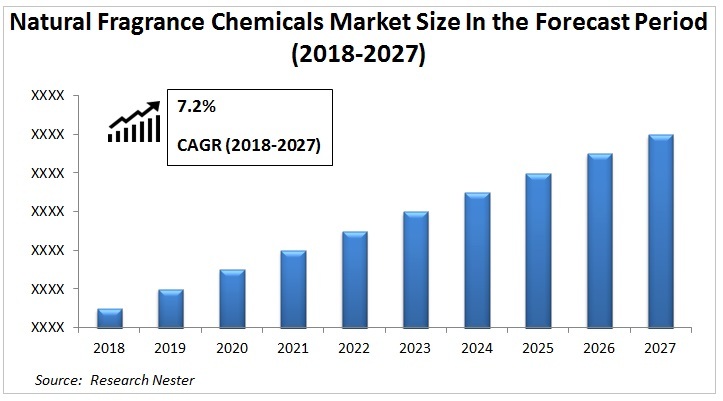 However, the cost constraints associated to natural fragrance chemicals as well as presence of synthetic alternatives in the market is predicted to slowdown the rapid growth of natural fragrance chemicals during the forecast period.